Almost every character who has met any combination of the Petrova doppelgängers has remarked that Katherine looked identical to Elena, Tatia, and/or Amara. As such, Katherine was an extraordinarily beautiful and seductive young woman: she had an oval face with fine bone structure, a wealth of brown curly hair, and almond-shaped, deep brown eyes with thick dark lashes. Katherine and Elena are remarked to be identical, but once you know what to look for, you can distinguish the two easily. Katherine's hair seemed to be a shade darker than Elena's, and she parted it on the left, while Elena parts hers in a deep part on the right. Elena seems to have naturally wavy hair, while Katherine's hair naturally had loose or tight curls. Katherine wore make-up very differently than Elena; Katherine favored a dark smoky eye with thick winged eyeliner, and her choice in lipstick was a darker, sultry pink appearance, while Elena preferred a bronze smoky eye and thin eyeliner. Katherine, having much curlier hair, seemed to have a much greater volume than Elena's, especially when Elena wore her hair stick-straight. There are even more subtle differences that only a true fan of Katherine or Elena can detect. Katherine's irises seemed to be a shade darker than Elena's, and Katherine seemed to squint slightly, while Elena's eyes are wide open, reminiscent of doe-eyes. Katherine was also incredibly theatrical in her movement, exaggerating almost everything as though she had rehearsed any given situation over and over again Katherine's choice in clothes was drastically different than Elena's. In season 2, 3, and 4, Katherine was seen wearing either leggings or dark super-skinny jeans to show off her fit figure, along with either blue, purple, or black tank tops. She would almost always wear a black leather jacket over her clothes, either cropped, full length, buttoned or with a zipper. An obvious way to distinguish Katherine's style from Elena's is by looking at Katherine's shoes. Katherine was always seen in black high heeled booties, open-toed pumps, or tall, black "500 dollar boots." Katherine was also seen to wear a lot more jewelry than Elena, including her lapis lazuli daylight bracelet, chain bracelets in either silver or gold, and a watch. In Season 5, she was seen to care less about her appearance, but was still seen in cute, fashionable outfits. She was shown in dark grey J-Brand jeans, lower heeled boots than when she was a vampire, and either black camisoles or long-sleeved shirts with lace sleeves. In Fifty Shades of Grayson, she was seen in sports gear, a baseball cap, and, during her final scene, a dark burgundy cardigan. When deducing where Katherine bought most of her clothes, she was quoted as saying that she bought most of her shoes in Paris. The majority of her jeans are J-Brand, and almost the entirety of her tops, especially those worn in season 5, were from Bebe. 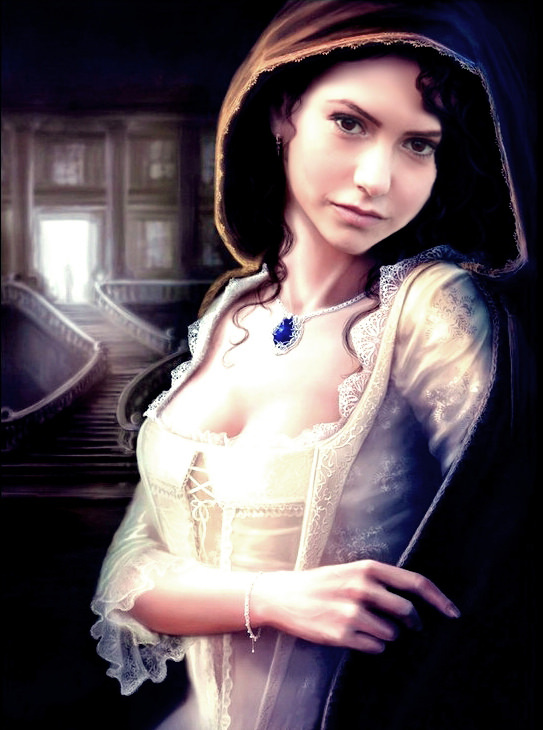 Whenever Katherine pretended to be Elena, she parted her hair in a deep right parting, and styled the front of her hair in loose curls and waves, leaving the back of her hair straight or slightly wavy. However, Katherine would choose clothes that Elena wouldn't wear, and the main distinguishing feature was usually her thick abundance of hair.